In less than two months, nearly 440,000 Jews were deported from Hungary in more than 145 trains. Most were deported to Auschwitz. German forces occupied Hungary on March 19, 1944. In April 1944, Hungarian authorities ordered Hungarian Jews living outside Budapest (roughly 500,000) to concentrate in enclosed ghettos located in certain cities, usually regional government seats. Hungarian gendarmes were sent into the rural regions to round up Jews and dispatch them to the cities. None of these ghettos existed for more than a few weeks, and many were liquidated within days. In mid-May 1944, the Hungarian authorities, in coordination with the German Security Police, began systematically to deport Hungarian Jews. SS Colonel Adolf Eichmann was chief of the team of "deportation experts" that worked with the Hungarian authorities. 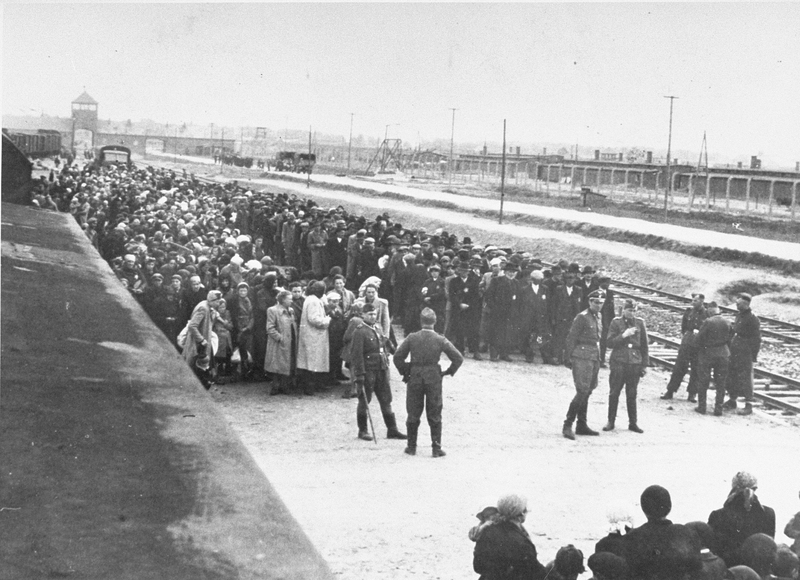 The Hungarian police carried out the roundups and forced the Jews onto deportation trains. In less than two months, nearly 440,000 Jews were deported from Hungary in more than 145 trains. Most were deported to Auschwitz. Thousands were also sent to the border with Austria to dig fortification trenches. In light of the worsening military situation and facing threats from Allied leaders of war crimes trials, the Hungarian Regent, Admiral Miklos Horthy, ordered a halt to the deportations on July 7, 1944. By that time, the only Jewish community left in Hungary was that of Budapest, the capital. May 15, 1944 - July 7, 1944 News articles about the deportation of Hungarian Jews. May 15, 1944 - December 31, 1944 News, editorials, op-eds, letters to the editor, and cartoons reacting to the deportation of Hungarian Jews. Braham, Randolph L. and Miller, Scott, eds. The Nazis’ Last Victims: The Holocaust in Hungary. Detroit: Wayne State University Press, in association with United States Holocaust Memorial Museum, 2002. Braham, Randolph L. The Politics of Genocide: The Holocaust in Hungary. Detroit: Wayne State University Press, 2000. Braham, Randolph L. “Hungarian, German, and Jewish Calculations and Miscalculations in the Last Chapter of the Holocaust.” Washington, DC: Center for Advanced Holocaust Studies, United States Holocaust Memorial Museum, 2010. Braham, Randolph L. “A Post-Mortem of the Holocaust in Hungary: A Probing Interpretation of the Causes.” Washington, DC: United States Holocaust Memorial Museum, Center for Advanced Holocaust Studies, 2012. Center for Advanced Holocaust Studies, ed. Hungary and the Holocaust: Confrontations with the Past: Symposium Proceedings. Washington, DC: United States Holocaust Memorial Museum, 2001. Vági, Zoltán, László Csősz, and Gábor Kádár. The Holocaust in Hungary: Evolution of a Genocide. Washington, DC: AltaMira Press, in association with United States Holocaust Memorial Museum, 2013.